On the phony pretext of combating ISIS, America and its regional allies support, a so-called Riyadh Declaration was agreed to by 55 Muslim countries in the Saudi capital on Sunday. Claiming it’s “to combat terrorism in all its forms, address its intellectual roots, dry up its sources of funding, and take all necessary measures to prevent and combat terrorist crimes in close cooperation among their states” is a statement of mass deception. Saudi Arabia, Israel and America’s regional presence constitute the epicenter of regional and global state terrorism – supporting its scourge, not combating it. “a global center for countering extremist thought…combating intellectual, media and digital extremism, and promoting coexistence and tolerance among peoples” based in Riyadh would be laughable if the threat posed by Washington, the Saudis and other regional rogue states wasn’t so grave. Riyadh Declaration signatory countries committed to provide “a reserve force of 34,000 troops” – not “to support operations against terrorist organizations in Iraq and Syria when needed,” as claimed. They’ll partner with Washington’s destructive imperial agenda, a plot to eliminate Syrian and Iranian sovereignty, assuring endless Middle East wars. Iran was especially singled out, the document saying signatories “confirmed their absolute rejection of the practices of the Iranian regime designed to destabilize the security and stability of the region and the world at large and for its continuing support for terrorism and extremism” – polar opposite Tehran’s agenda. It’s targeted for its sovereign independence, a nation America doesn’t control, a Saudi rival. Imperial plans call for regime change. Sadly as Zarif knows, US and Saudi policies foster terrorism, using ISIS and like-minded groups to further their imperial agendas. 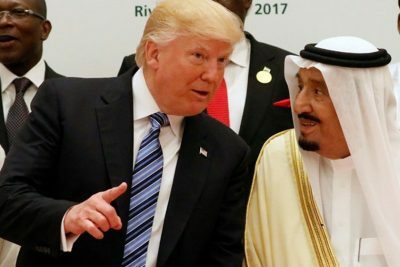 Trump’s Sunday Muslim world address was an exercise in deception – exposed by longstanding US policies, its endless wars of aggression, and announced deal to sell Riyadh hundreds of billions of dollars worth of powerful weapons over the next decade, entirely for offense, not defense. Washington’s goal isn’t “stamping out (terrorist) extremism,” as Trump claimed, it’s supporting and encouraging it to further US aims for unchallenged global dominance. The Riyadh Declaration is part of the scheme to pursue this objective, polar opposite what its signatories claim.